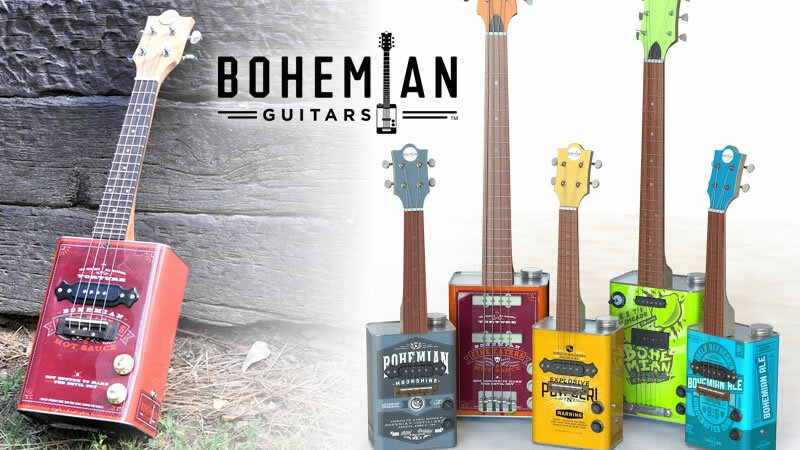 ATLANTA, GA – August 20, 2015 – (GuitarPR) – Today, Bohemian Guitars (www.bohemianguitars.com) launches the Boho 2.0 series, introducing the Ukulele, Bass and improved standard bodies to its upcycled oil can guitar line. In addition, Bohemian Guitars (BG) reveals three completely new designs; Bohemian Ale, Electric Limeade and Hot Sauce. Bohemian Guitars goes back to crowdfunding to launch the pre-order sales of the new Boho 2.0 series with early bird sales starting at $89 for the Uke ($100 msrp), $199 for the guitar ($299 msrp) at $350 for the Bass ($450 msrp). Indiegogo houses some exclusive opportunities to select limited edition guitars that include G.Love and Special Sauce and a small run of “Build your Own” Boho’s that allows backers to customize and create their own branded guitars. Continuing its vision to support the community and create a sustainable future, Bohemian Guitars has partnered with Trees for the Future and will plant 1 tree for every purchase. The majority of the wood used to build the neck of the guitars is sourced from sustainable forests and continues to explore the use of reclaimed woods. As Bohemian Guitars grows, similar programs will be extended to the Boho community and will continue to work to reduce BG’s environmental footprint. Bohemian Guitars has already received acclaim and the support of many notable industry musicians including: Hozier, Billy Gibbons (ZZ Top), G. Love, KONGOS.